In my last post I discussed the latest changes to grading in Pittsburgh. Back in the fall they decided to create a minimum grade of 50 in order to decrease the number of students who are failing. Now they want to implement a system where students are graded 0-5 on each assignment. There are multiple ways to convert column 1 to columns 4-6. For example, some think 98 is an A+, some think it's an A. 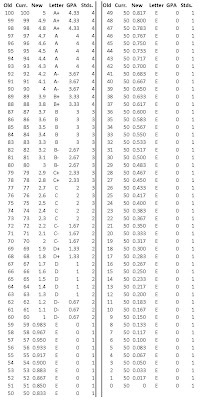 But what I have in the table should be really close to how it's usually done (the table is either how teachers I had normally graded or how I graded when I taught). Click on the table to see it in a readable quality. So, what does this mean? How will this affect students? Let's take a look at four sample students to find out. Below are four very different made-up students. 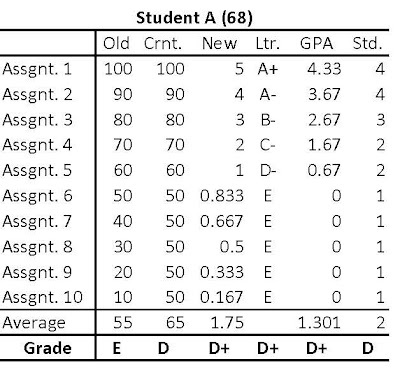 I've put the 100 point equivalent of the grade they'd receive under the new system at the top of each table. Student A is all over the map. He does a little of everything and gets a wide range of grades. Under the old system he would've received a 55 and failed. Under the current system he'd squeak by with a 65. Under the new system he'd receive a D+ with the equivalent of a 68. 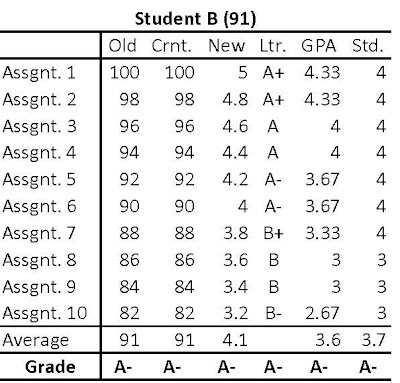 If we graded by letter, GPA, or standards system he'd likely receive a D. Why is this? If we take the averages of every single grade possible under each system -- the equivalent of every grade from 0-100 -- the new system has the highest average grade among the three used in Pittsburgh. Meaning that if a student completed 101 assignments over the course of a semester and received every grade possible, they'd receive a 50 under the old system, a 63 under the current system, and a 65 under the proposed system. Student C is a struggling student. He makes sure he turns in something every time, but sometimes it's decent and sometimes he just writes down whatever pops into his head and turns it in. 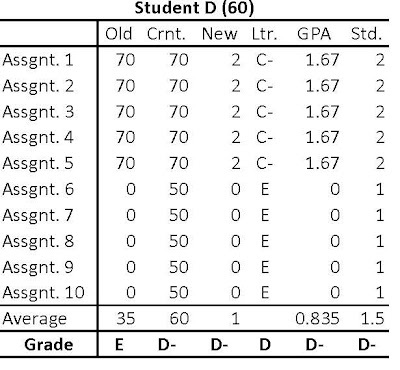 As a result, he has a wide range of grades between 35 and 80. He would fail under both the old system and the current system, but would easily pass under the new system. Student D is a C student when he feels like it, but doesn't bother doing his work half the time. Under the old system, he wouldn't have been close to passing. But under both the current and new systems he would just eke by. Under the new system, a 0 is equivalent to a 50 right now. In other words, although the new system seems to be designed so that students who put forth no effort get a much-deserved 0 in the grade book, the consequences of a 0 aren't really that dire. 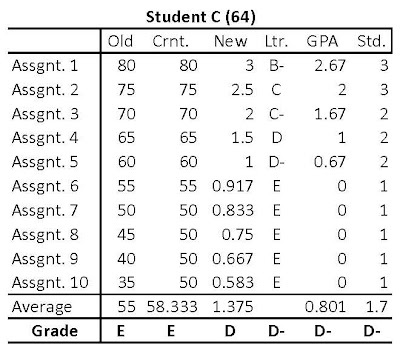 An A is still an A, a B is still a B, a C is still a C, a D is still a D. The only difference between the current and new systems is for grades between 1 and 59. Students who earn at least a D on every assignment will not be affected at all. Students who receive a D or above on some assignments and a 0 on every other assignment will not be affected at all. But students who complete at least a portion of an assignment, but receive an E will do better under the newer system than the current system -- and much better than under the old system. Also, notice that the current and new systems are much closer to other alternative systems. Maybe it would be easier for everybody if students were simply graded A-E on each assignment and then we averaged those at the end of the term. It's less precise, but it's the simplest and most familiar system. In short: passing was most difficult under the old system, is much easier under the current system, and will be easier still under the new system -- there's no possible combination of grades that will yield a lower grade under the new system than under the current system. One is how much "effort" should count for. Is handing in badly done assignment and getting a 60 really better than not handing one in at all? Does Pittsburgh believe that students are actually learning the material, but are messing up their grades by not handing in homework? Or are they undermining teachers' efforts to encourage kids to work by taking away the severe negative consequence of a zero. A second (in some ways closely related) is whether a district should have a one-size-fits-all grading policy. Does 70% mean the same thing in Music and Phys. Ed. and 7th grade English and A.P. Calculus? And do teachers end up changing their requirements so that the scale works for their expectations?